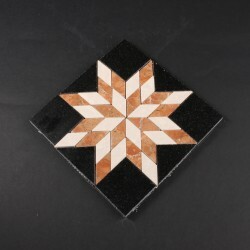 One of the most common designs we have people asking for is a square medallion. Our Common sizes are 30 inch, 32inch, 36 inch, 40 inch and 48 inch. Please note that all sizes are approximations. And that Stone can vary greatly from piece to piece. If you want to make a truly custom made medallion please come in to our store at 6290 South Pecos Road, Suite 100, Las Vegas Nevada 89120. Our Store Hours are 8 am to 5 pm Monday thru Friday and 9 am to 3 pm on Saturday. If you would rather have a circle, rectangle, or octagon, we have those as well.